Not everyone has neighbors who spend their evenings loudly moaning, complaining and indulging in noisy romantic pursuits all night long. And no, we haven’t moved into a cheap hotel in a frontier town. And since these neighbors are weighing in at three tons, we’re not going to be asking them to tone it down! 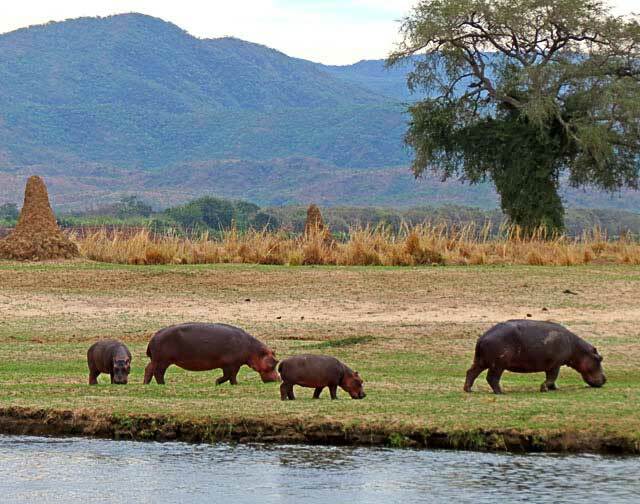 A hundred yards or so from our patch, down at the river, pods of hippos live in deep pools that are full of water – even in the dry months of winter. 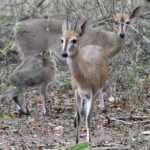 But seeing they can be heard two miles (3 km) away, it’s what happens when they get vocal that can curdle the blood close-up. Especially if you’re half asleep. Described as “honking,” the bulls let out an impressive bellow when advertising territory or warning off would-be competition. But the cows aren’t shy and retiring either and the whole pod can sound off with a series of howls, grunts, squeals and shrieks, low deep moans and anguished cries. 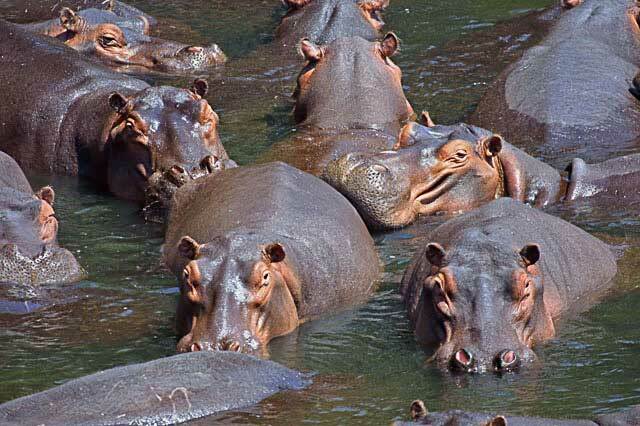 Groups of hippos are called a pod and a single male hippo will defend a territory made up of herds of females and young. 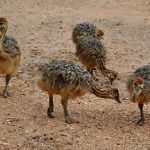 It’s an old-fashioned harem system, with pods of 2 to 200 animals. Usually, a pod will be about 7 to 25 or so individuals. With nearly hairless, barrel-shaped torsos, enormous mouths and large sharp canine tusks, hippo adults average 3,300 lb (1,500 kg) for males and 2,900 lb (1,300 kg) for females. You’d think that with the “handsome” odds stacked against them, the bulls would be a bit more romantic but there’s no courtship for the hapless females – it’s all business. Hippo calves are born in shallow water so they can breathe but within minutes of birth, they can swim and walk. The young suckle underwater, being able to close their nostrils and fold their ears just like their grownups. 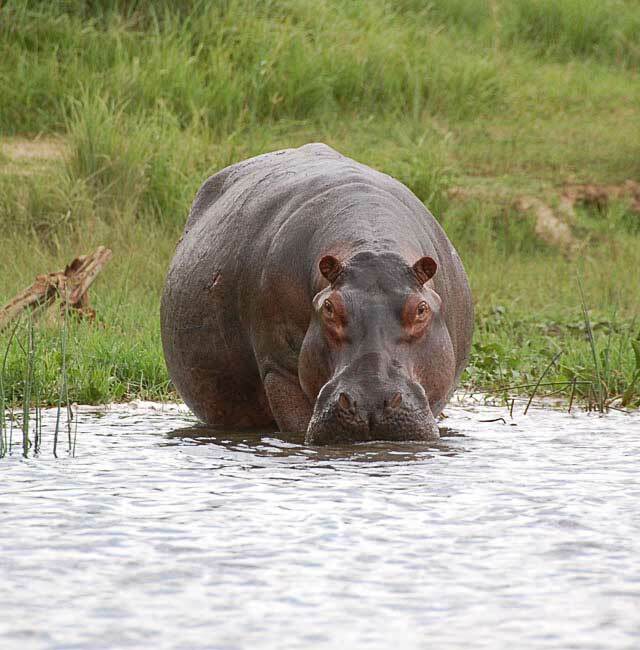 The hippo is the largest species of land mammal after elephants and rhinoceros. Ungainly on land with its stocky shape and short legs, a hippo can still run at speeds around 25 mph (40 km/h) – even outrunning a man who’s max speed is 27.8 mph or 44.72 km/hr – when aggravated. 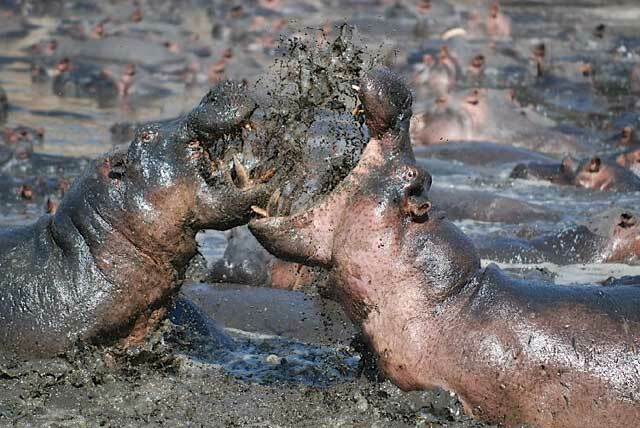 Highly aggressive and unpredictable, the hippopotamus is considered the most dangerous mammal in Africa, having killed more humans than any other single mammal. 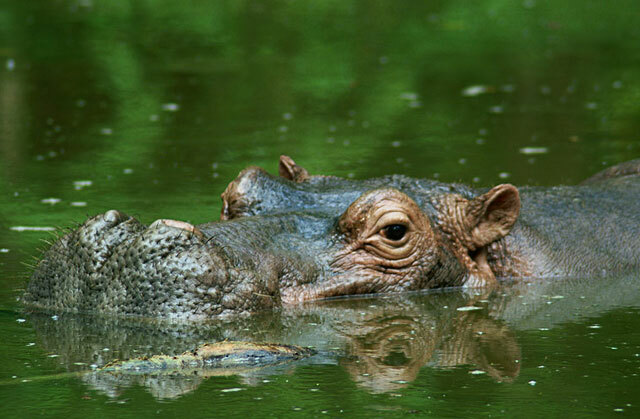 The common hippopotamus is semi-aquatic, inhabiting rivers, lakes and swamps and is classified as “threatened” because of habitat loss and poaching (their meat and ivory canine teeth). 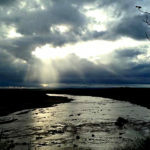 Territorial bulls preside over a stretch of river and groups of five to 30 females and young. During the day, they remain cool by staying in the water or mud. 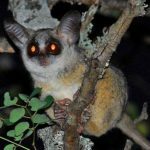 Their skin is astonishingly sensitive to moisture loss – seven times more than other mammals. Hippos surface at dusk to graze on grass and although they rest close to each other in the water, grazing is usually a solitary activity. 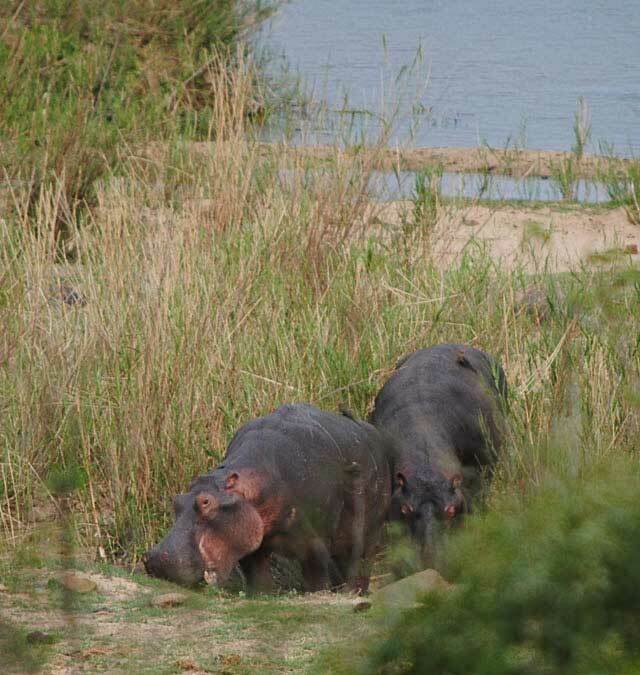 Don’t ever block a hippo’s escape route back to the water or get between a mother and her baby. 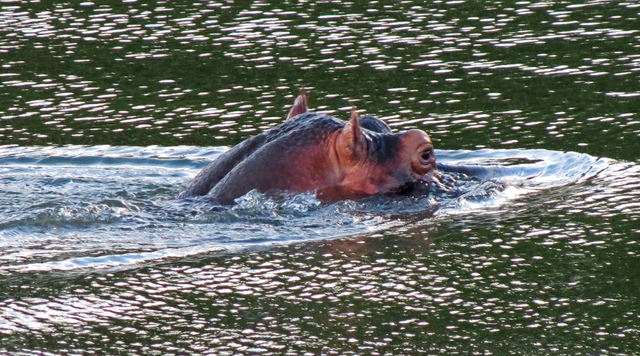 Many people have lost their lives when a panicked hippo charges headlong for the water. 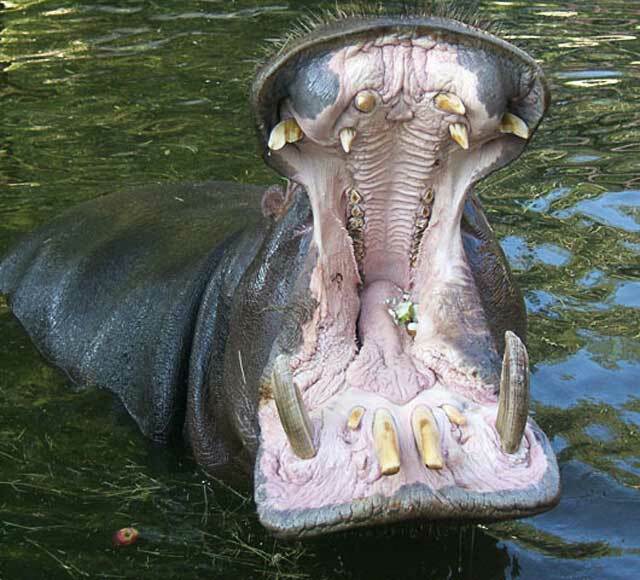 The next story illustrates how big the mouth of a hippo is, in terms of human size. 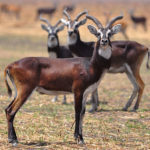 Some time back, M was the guide working with a National Geographic expedition in the Okavango Swamps of Botswana. He recalls that one of the boatmen had huge scars on the left side of his back and shoulder. When questioned about the incident, the man related a horrific tale, as well as the value of keeping your head in the face of tragedy – after removing his shirt – he showed off the scars front and back where the hippo bit him… While descriptively indicating with his hands, he continues to tell the tale of how his boat’s motor broke down, 100 miles (160 km) from base camp, over a hippo pool, in the middle of the river, (swamp) that flows past Chief’s Island (Botswana). While bending over the open cover of his Mercury outboard engine, still on the transom, a hippo unseen by him – not liking his presence – bit down on the boat, motor and him in one mouthful, squashing him down onto the motor, then let go and swam off. The boat and motor sank while he still conscious, paddled to the shore. After treating his wounds with a mud pack, he rested for the night in the mud. The next morning he dived out the motor and tools, after repairing the motor, he then dived out the boat and repaired it as well. 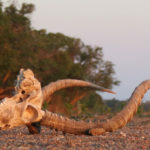 Three days after the incident he arrived home and was admitted to the Maun clinic. In those days – late 1960’s – there wasn’t even a tarred road in the town of Maun, never mind a hospital. 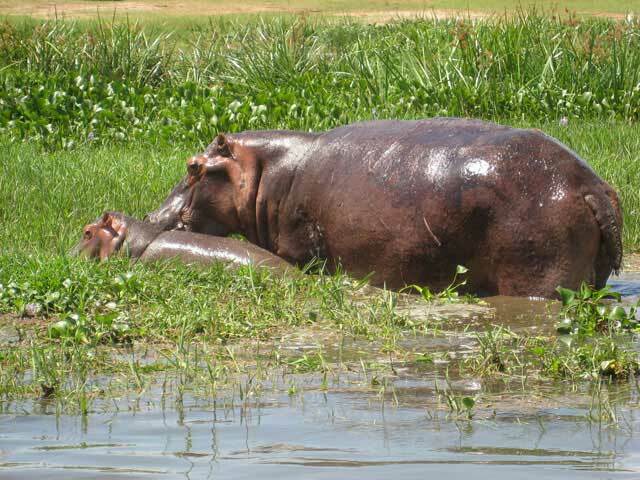 It maybe nice to know that hippos make wonderful pets – if raised correctly from young – and few people are aware of this. 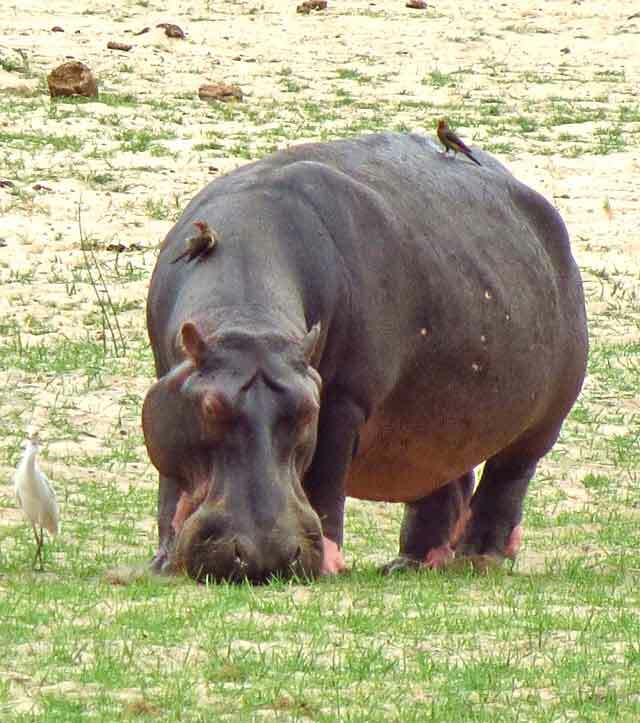 Here’s an African Folktale of how hippo lost his hair when hippo was wild and wolly.